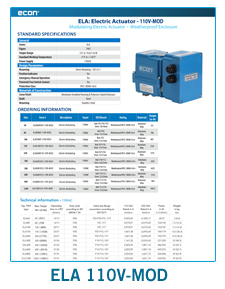 ELA-series modulating electric actuators are available in several supply voltages. 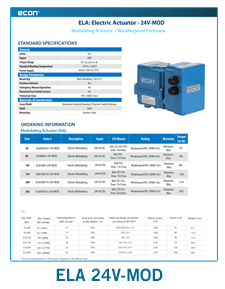 The electric actuators are built to comply with protection class IP67. The standard thermal switches in the motor windings protect the motor from overheating. The actuators also feature torque switches and two potential free switches (except ELA80 and ELA100). All actuators have standard a high ratio self-braking worm wheel drive, and include a hand wheel for emergency manual operation. The hand wheel is idle when operating electrically, but can be engaged when emergencies occur. This creates a mechanical connection between the hand wheel and the valve. By using the standardized ISO 5211 mounting flange, these actuators can be easily mounted on most quarter-turn valves, such as ball valves and butterfly valves.